GNU GLOBAL is a source code tagging system that works the same way across diverse environments, such as Emacs editor, Vi editor, Less viewer, Bash shell, various web browsers, etc. It runs in UNIX (POSIX) compatible operating system, like GNU and BSD. GNU GLOBAL is part of the GNU project, and is free software. You can freely copy, modify and redistribute this program under GNU GPL. C, C++, Yacc, Java, PHP4 and assembly. To use the parser, please see the file 'plugin-factory/PLUGIN_HOWTO.pygments' in the package. finds locations of specified symbol quickly. locate not only definitions but also references. locate paths which matches to the specified pattern. searches not only in a source project but also in library projects. generates completion list for completing input method. allows customizing of the set of candidate files to be tagged. understands POSIX 1003.2 regular expression. supports idutils as an external search engine. tag files are independent of machine architecture. supports incremental updating of tag files. plug-in parser is available to treat new language. generates a hypertext of source code. compact format to save disk space. supports client/server environment (TRAMP ready). 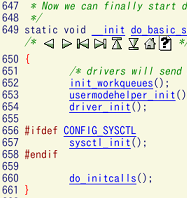 ignores binary files, dot files and specified files. includes grep-like command (-g command). deals with loop of symbolic links well. Please also see 'Comparison with Similar Tools' in the OpenGrok project site for comparison with other tools. If you have a plan to make a yet another editor with tag facility, you can use GLOBAL for it. May the GLOBAL be under you like the globe!